The National Football League returned to Baltimore on September 1, 1996 as the newly-relocated Ravens hosted the Oakland Raiders in the season-opening game for both teams. It was the first NFL regular season game played in Baltimore in 13 years, since the Colts vacated for Indianapolis. The Ravens were in actuality the former Cleveland Browns franchise. As part of a deal between the NFL and Cleveland, the team renounced its history, name, and colors, to transfer to a future expansion franchise. The club also made changes to the front office and had a new head coach in Ted Marchibroda, once coach of the Baltimore Colts, replacing Bill Belichick, under whom the team dropped to 7-9 in its final lackluster year in Cleveland (not helped by long-time owner Art Modell announcing midway through the season that the franchise would be moving in ’96). While much was new, there were still lingering problems from the previous year. There were concerns regarding the running game, and 32-year-old QB Vinny Testaverde was prone to inconsistency and throwing interceptions. The defense was in need of retooling, but there were high hopes for rookie LB Ray Lewis. The Raiders, coached by Mike White, had returned to Oakland the previous season after a 13-year hiatus in Los Angeles. Getting off to an 8-2 start, they lost their last six games to finish at .500. An injury to QB Jeff Hostetler was a key factor in the collapse, and he was out again for the start of the ’96 season. Backup QB Billy Joe Hobert was taking his place. WR Tim Brown was the most consistent receiver and it was hoped that rookie TE Rickey Dudley would have an impact. There were 64,124 fans in attendance at Memorial Stadium on a pleasant and sunny day and several ex-Colts stars took part in the pre-game festivities, including Hall of Fame QB Johnny Unitas and DT Art Donovan. The teams traded punts to start the game before the Ravens drove 85 yards in eight plays. 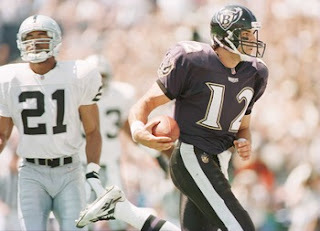 Vinny Testaverde completed three passes, including one to WR Derrick Alexander that covered 48 yards to get the ball into Oakland territory, and the veteran quarterback finished off the series by running up the middle for a nine-yard touchdown (pictured at top). Matt Stover added the extra point, and with less than a minute remaining in the first quarter the home team was ahead by 7-0. The Raiders started off the second quarter by going 79 yards in nine plays. Billy Joe Hobert (pictured below) threw to WR James Jett for a 33-yard gain to the Baltimore 34 on the first play and Hobert converted a third-and-two situation with a pass to WR Daryl Hobbs for 15 yards to the 11. Three plays later, Tim Brown pulled in a toss from Hobert for a seven-yard TD and Cole Ford tied the score with the point after. Oakland appeared to get a major break on the ensuing kickoff when RB Earnest Hunter fumbled and safety Dan Land recovered for the Raiders at the Baltimore 19. But on the next play, Hobert’s throw intended for Brown in the end zone was instead intercepted by Ray Lewis for a touchback. A short possession in which Testaverde was sacked for a 19-yard loss resulted in a punt and, taking over with good field position at the Baltimore 47, the Raiders did not come up empty. After two short runs, Hobert connected with Jett for nine yards and then to Rickey Dudley for a 30-yard gain. RB Harvey Williams covered the last five yards for a touchdown and, with Ford’s PAT, the visitors were ahead by 14-7. That remained the score at the half as the teams exchanged punts for the remainder of the period. The Raiders had the ball first in the third quarter but Hobert again was picked off, this time by CB Antonio Langham who returned it 28 yards to the Oakland 25. The Ravens were unable to move from there, and following a third-down sack, punted. But the visitors remained bottled up deep in their own territory and, after Jeff Gossett’s 43-yard punt that was returned for nine yards by WR Jermaine Lewis, Baltimore started its next series at the Oakland 45. Utilizing a no-huddle offense, Testaverde completed three passes, including one to WR Michael Jackson that picked up 21 yards, but the drive stalled inside the ten. Still, the Ravens got points on a 25-yard Stover field goal to narrow the score to 14-10. The Raiders again had to punt following their next series and Baltimore responded by advancing 56 yards in seven plays. Testaverde completed two passes to TE Brian Kinchen, one of which gained 29 yards to the Oakland 26, and while a reverse by Alexander lost 13 yards, two more completions got the home team back into field goal range. Stover was successful from 37 yards and it was a one-point game at 14-13 after three quarters. Another possession by the Raiders ended with a punt. Starting from their 17, the Ravens moved quickly as Testaverde connected on passes to Jackson for 27 yards and Earnest Hunter for 25 to reach the Oakland 31. FB Carwell Gardner picked up nine yards on three carries and Testaverde ran around end for 12 yards to get inside the ten. 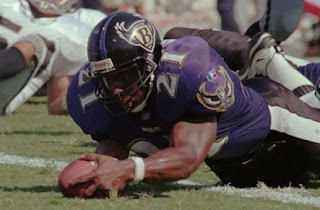 Finally, on the eighth play of the 83-yard possession, RB Earnest Byner reached the end zone from a yard out and, while the try for a two-point conversion failed, the Ravens were ahead by five points. That proved to be all the home team needed. The Raiders had two more possessions but went three-and-out both times and Baltimore was able to control the ball for the last 4:47 of the contest to come away with a 19-14 win. The Ravens led in total yards (314 to 238), first downs (21 to 13), and time of possession (34:38 to 25:22). Oakland turned the ball over twice, to one suffered by Baltimore, and was hurt by 12 penalties, to just two called on the Ravens. Both teams recorded three sacks apiece. Vinny Testaverde completed 19 of 33 passes for 254 yards, with no touchdowns but also no interceptions, and he ran for a score. Earnest Byner (pictured below) rushed for 43 yards on 14 carries that included the game-winning TD and caught four passes for 32 more yards. Brian Kinchen and Carwell Gardner also co-led the team with four pass receptions apiece, for 57 and 16 yards, respectively, while Michael Jackson was the yardage leader with 60 on his three catches. For the Raiders, Billy Joe Hobert was successful on 17 of 26 throws for 192 yards and two TDs while being intercepted twice. James Jett topped the club with 65 yards on his four pass receptions and Tim Brown scored on two of his four catches, for 31 yards. Harvey Williams gained 39 yards on 13 rushing attempts. While the season started on a high note for the Ravens, they lost their next two games on the way to ending up at the bottom of the AFC Central with a 4-12 record. Oakland got Jeff Hostetler back into the lineup for 13 games but went 7-9 to finish in fourth place in the AFC West. Vinny Testaverde had a big year for a mediocre team, achieving career highs with 4177 passing yards and 33 touchdowns, both of which were still single-season records for the Ravens through 2014. He was selected to the Pro Bowl.